James has been a bit depressed ever since his sister, Jorie, got kicked out of their house. His parents are hard to deal with (he calls them "The Brute" and "The Banshee" if that's any indication) and all James want is to figure out how to get Jorie back. 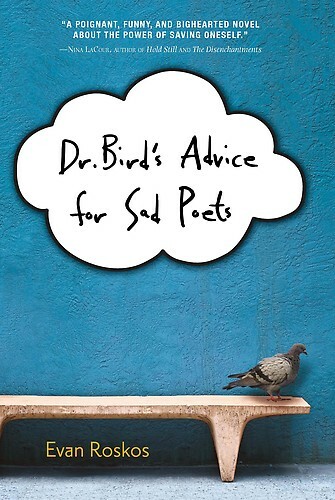 He enlists the help of his imaginary pigeon psychiatrist to work through his issues and come to terms with the fact that maybe his sister is better off gone. James was an interesting narrator. He was at times a bit strange but he was very earnest. Evan Roskos blends humor and emotion to make a more palatable issues novel. There are a lot of things going on in James world and he doesn't really have anyone to turn to. He tries to tell his parents he needs help but, like they told his sister, it's just a faze and they won't pay for it. James is depressed and trying to cure himself with Whitman, pigeons and hugging trees. This can only work for so long. James goes on a journey in this novel and it's not done by the end. Dr. Bird's Advice for Sad Poets is an honest look at depression and anxiety. It's not "a faze" and you don't just wake up one morning and are cured. It takes work and empathy and lots of other things. Roskos shows this in the novel and that makes this novel what it is. James struggling to find his way through the tumultuous teenage years makes this novel wonderful and heart-breaking and honest. This is just a great novel. It's light enough that you don't just feel depressed reading it. Even though it's funny, it's not frivolous. James has to face some tough facts and he has to deal with them (mostly) on his own. Definitely add this to your 2013 reading list. You're bound to love it. "I yawp most mornings to irritate my father, the Brute." "The anxious vomiting butterflies wake with a burst."